We are delighted to announce our brand new training menu! There are so many great features in the Diver Solution that although it’s simple to use, you may not have yet discovered all the tips and tricks that can make your user experience so much more rewarding. So whether it’s a one-to-one tutorial or a group training session that appeals to you, have a look through the options in our new brochure and get in touch with us to reserve your place now. 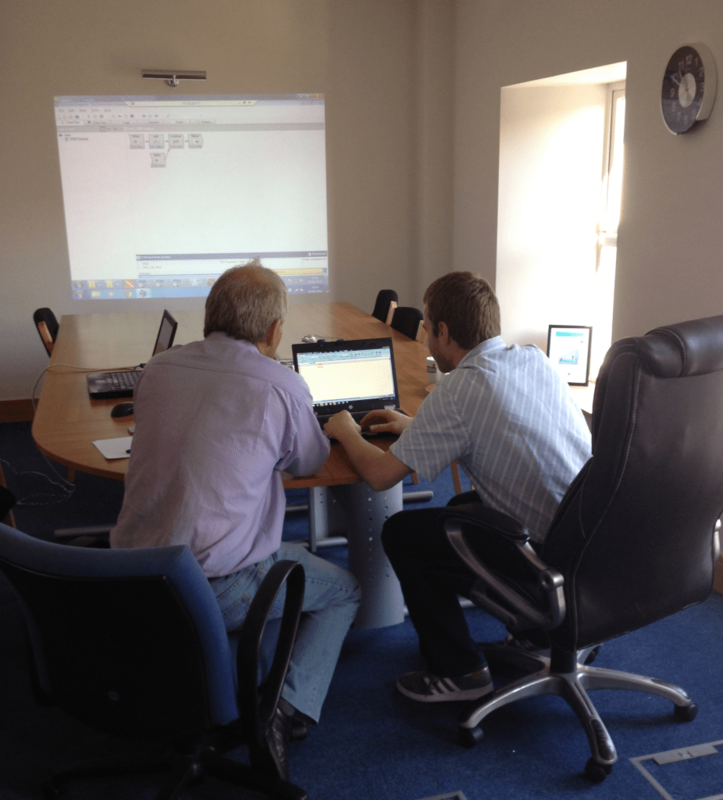 DBI’s CTO, John Spillane, mentoring a Diver developer using the Visual Integrator in a one-to-one training session. 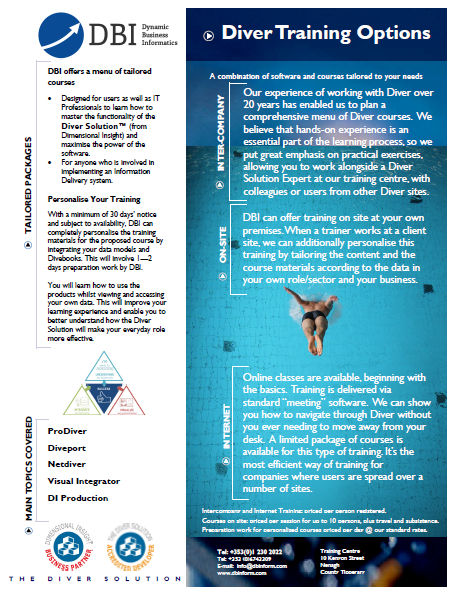 Our training courses range from ProDiver for complete beginners through to administration of the Diveline Server and Diveport design, with separate courses for developers using the Visual Integrator and Production Tools. We can work with you at either of our two training centres, at your own premises, or online via meeting software. We can also tailor the courses to use your own data and models. Despite the simplicity of the end-user interfaces of any Diver or related application, there is always a learning curve that is best experienced alongside an expert. With our years of experience we recognise that there are tips and tricks we have learnt that make the design phase of new reports and dashboards so much faster and more efficient. On any deployment we always build in a short period of end-user training, which suffices to get everyone up and running with ad-hoc analysis tools. But for more advanced and administrator features we recommend that you take a little more time with us, and refresh when any new release delivers significant functionality that you haven’t seen before. We offer individual or group training, either at our training facility or on site at your premises. Get in touch for more details. Whilst most of the core application and automation routines will be set up by our development experts as part of any deployment, we always like to pass on our knowledge to in-house IT people so that you save money when you want to expand your BI into other parts of your organisation. As part of a deployment we usually share our development techniques with interested parties, and offer development training to allow you to integrate with any data sets and build your own models. Again we offer individual or group training, either at our training facility or on site at your premises. Get in touch for more details. If you do not have in-house IT support that is not an issue, as we can offer you application consultancy which means we can carry any new development work that you may require to enhance your initial deployment as your business changes over the years. Please see the Consultancy Page.